I really hoped to finish my current read today but it wasn’t to be. I can’t believe the low total of books finished this year – I’ll disclose that tomorrow but it’s a bit shocking and I’m going to make more time for reading in 2015. Anyway, here’s one last review of another highlight, and a pic of the lovely new books I’ve been lucky enough to receive for Christmas. I hope you’ve all had a nice read over the Festive Season and are busy making your Best Of lists (again, that will appear tomorrow). My friend Gill passed this to me as it was the book she was giving away for World Book Night. I read a lot of ‘children of immigrants in the UK’ and ‘tales of emigration’ books, so I thought I knew what I was expecting, but this packed quite the emotional punch. Full of substance, feeling and discussing matters that are important to discuss – I’m not going to give the main theme away as I certainly didn’t know what it was before reading the book, but a simple discovery blows the author’s ideas about his family wide apart, and he has to work to draw the edges of his experience back together and make sense of it. However, he finds that his family history resists fitting into neat categories and realises that it’s easier to find out facts about a golden-tinged celeb than it is about a poor Asian immigrant who is illiterate and has health problems. He ends up including letters he wrote and letters he didn’t send, and verbatim reports of conversations, as well as the history of his family and his own probings of his relationships with his family members. It’s not all misery, though – it’s wry and funny where it needs to be, and full of affection and respect for his family. A good read. On to Christmas acquisitions! Oh – I did acquire one more book in November – a hardback copy of Francis Brett Young’s “This Little World”, which I have read. I bought it for a Secret Santa giftee, but when it arrived, it had a hole in the SPINE, made when something sharp had spiked through the (thin grey plastic) envelope and torn the book. I couldn’t send that as a present, so I’ve kept it, and got some other books for my Secret Santee. Grrr. 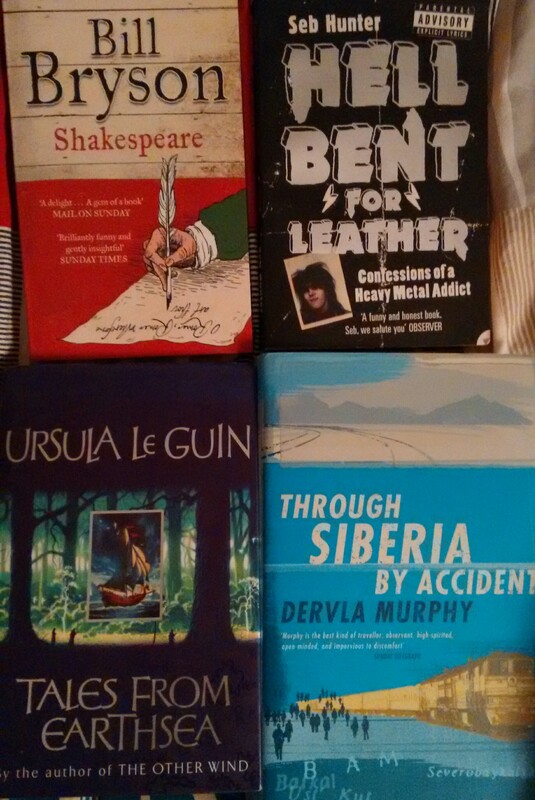 Anyway, here we have my BookCrossing Birmingham collection from the lovely Julia – Bill Bryson’s “Shakespeare”, Seb Hunter’s “Hell Bent for Leather”, the memoirs of a rock fan, Ursula Le Guin’s “Tales from Earthsea” which is short stories, and Dervla Murphy’s “Through Siberia by Accident”. 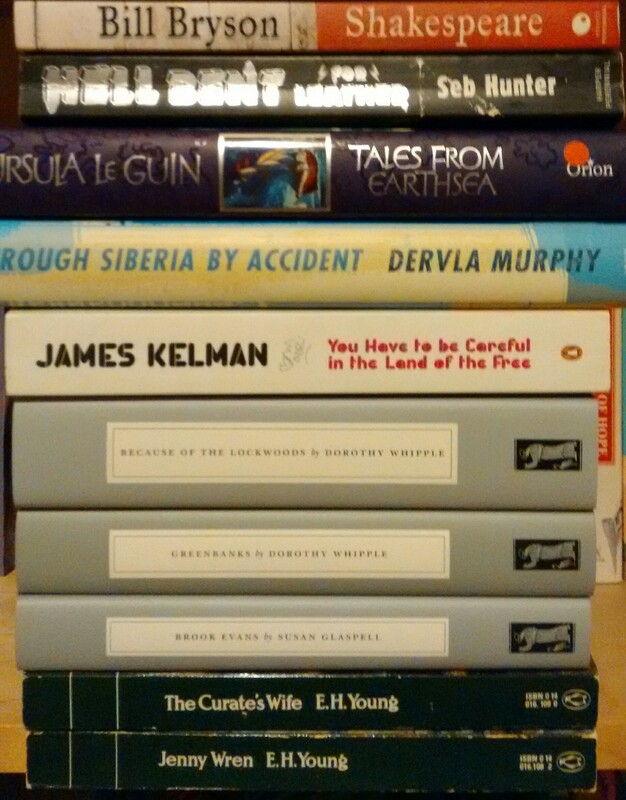 All on my Wish List for years so well chosen, as was James Kelman’s “You Have To Be Careful in the Land of the Free”, from Gill. My LibraryThing Virago Group secret santa found me two E.H. YOungs I didn’t yet have – “The Curate’s Wife” and “Jenny Wren”, and I can’t wait to read those lovely Greens (I also received a good scattering of dark chocs and a beautiful bookmark from the lovely Laura). And on my trip to the Persephone Shop back in November, I picked up three grey lovelies for myself from friends – so have Dorothy Whipple’s “Greenbanks” and “Because of the Lockwoods” from Ali and Bridget respectively, and Susan Glaspell’s “Brook Evans” from (editing friend) Laura. How lovely these all are and how tempting! This – THIS – is why I leave doing my Books of the Year until the year has properly ended. In fact, I think that one of the books I’m reading now will make it into my Top 10 for the year, too. You never know what you might come across. I have had compulsive reading sessions over the year, but I actually missed the opportunity to open a couple of presents on Christmas Day before our carriage arrived to whisk us off to the in-laws’ for lunch because I could. not. stop reading this book. I’m even excited about the fact that I can now go back and read other people’s reviews that I’ve saved up for months! A novel of Nigeria, the US and (less) the UK, this is the story of Ifemelu, who can never quite forget her first love, Obinze. She makes a new life for herself in America – becoming the ‘Americanah’ of the title – discovering issues about race that she never knew existed and ending up being a successful blogger. When she returns to Nigeria to work for a magazine run by a wealthy socialite, she finds Obinze, who she has pretty well lost touch with after experiencing tough times in America, is now a wealthy property developer. The experience of her aunt, favoured by a general on one side of a power struggle and forced to flee when the struggle turns, is always in the background, and she is confused by and wary of the new social order she finds herself in. This unputdownable novel flits between many locations, but it’s always clear where we are, when, and with whom. We keep returning, in a nice framing motif, to the hair salon where Ifemelu is getting her hair braided before returning to Nigeria, which allows us to learn a great deal about the experience of Nigerians in the US and the contrast between their experiences and expectations and those of people from other African countries and American-born black people (to use the categorisation used in the novel). There are sympathetic and nasty characters of all races and positions in life, making this a colour-blind as well as racially aware novel, and it’s also a very good story. In addition to the characters and story, and the excerpts from Ifemelu’s fictional blog, there were also interesting discussions about whether you can understand a culture from reading novels about it, a real index of white privilege referenced and inserted into a blog post which should be required reading for everyone in the world, and a fascinating portrayal of some aspects of what it was like to be black and in America when Barack Obama was elected. I’m very glad that I’ve finally read this excellent book. Bought on our post-wedding break in the Lake District. A jolly read and a classic Heyer, even though it’s one of her very early ones. There’s an ageing patriarch deciding to marry off his grand-daughter to ensure her inheritance, and some argumentative cousins, a feisty heroine and a second heroine with amused grey eyes and a more sensible outlook – so lots of boxes ticked there. We even have someone being shot in the shoulder, which is a regular occurrence in Heyer’s novels. But it’s not samey at all – it’s delightful and has a galloping plot, period detail, charming characters and some light satire of young women’s flights of fancy based on the Gothic novels they’ve been reading (“Northanger Abbey” of course also does this). This book also ticks off 1936 in my Century of Reading. More reading to come, as I said. Hope you’re having a warm, well and book-filled time of it! I don’t think this was a Valentine’s present as such; I suspect that I was randomly in the bookshop and asked for this to be bought from what we refer to as ‘Bank of Matthew’ – a Christmas and Birthday fund which takes away from the bother of having both main gift times within a month of each other and spreads the shopping joy (hmm) over the year. As it says, this is a book of fairly simple sewing project, both useful and simply decorative, showcasing the lovely Liberty fabrics that I’ve known since my childhood (although they can be made up in any fabric you choose). Did anyone else go and buy those skirt or dress lengths from the Liberty shop (or perhaps your local Bentalls) where you just had to sew up the side seam and do the hem and there was a lovely flowery skirt with an elasticated waist or a sundress with a shirred bodice? None of those in this book, but seeing those fabrics did remind me of those heady days in the 80s. The text is simple and the illustrations useful – the patterns do have to be blown up using a photocopier, but the instructions for doing that are nice and clear. The confident assertion that the lack of nice fabrics being used to make commercially available pet beds being a home design worry did make me giggle, but overall this has some lovely patterns and gift ideas, and I will be attempting some of them in the months to come. This was the last part of my lovely Virago LibraryThing Group secret santa gift from the lovely Verity. Like, I suspect, many of my UK readers, I was a member of the Puffin Club in my childhood, so it was good to find out about this biography of the founder of Puffin Books and the Club. Were you a member? 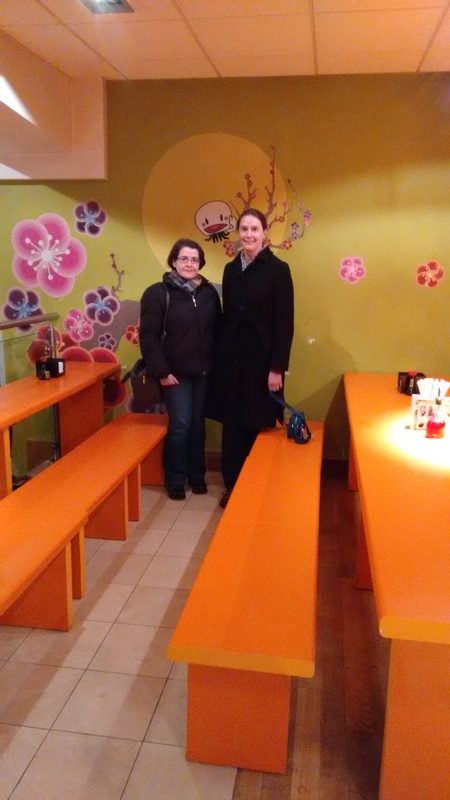 Did you go to any of the meetups or even the holiday trips? Both Matthew and I recall going to event in London – I certainly met Harry Secombe at one, but went to a few. What about you? It’s a right old trip down memory lane today, isn’t it! Anyway, moving on to the review, as with many heroes – and book-related ones – Kaye Webb wasn’t quite as I imagined, with several marriages and a sometimes less than ideal relationship with her children. She herself said that her career went marvellously, but not so much her private life. The book was well-researched and comprehensive, while remaining lively and interesting. There were reminiscences from many colleagues and authors with whom she worked. The best part for me was reading about the authors and other people who are now well known who started out as Puffin Club members and, often, competition enterers, before going on to their further careers. The details of the guardians of a Puffin time capsule (now held in a museum) were interesting, too. Ultimately, I got an impression of a woman whose life was so wrapped up in and invested in her work that she was really very lost when she retired and her author friends started to drop away. A lesson to us all to not concentrate on one area of our life only, perhaps. So, two good reads there, and more to come. Do share your memories of Liberty fabrics and the Puffin Club – I’d love to hear about their role in your early lives, if they had one! See, now I’ve got a bit of breathing space, I’m whizzing through books. So there’s a bumper three for the (no) price of two reviews today, and I’ve already finished another one. It’s looking like it’ll be “Americanah” on Christmas Day/Boxing Day, which I’ve very excited about – I’ve been saving up other people’s reviews to read once I’ve read that one. That, incidentally, is why I only ever publish my “best of” post on 1 January: you never know what you’re going to read in the end period of the year, and I was vindicated in this the year that “Daniel Deronda” was the last book I picked up in 2012 and would have been my top book for that year, had I been able to stay up late enough to finish it at the end of that December (it was in my top ten for 2013, instead). Anyway, here we have three books that look at mapping, history and travel in various ways – an excellent trio of non-fiction with plenty of time to read them. A slim volume I’d been after for ages, which charts Phillips’ journey around Europe, basically looking at race relations and social issues. Chillingly when read today (it was published in 1987), it talks of the rise of racism, the rejection of people from former colonies of European countries and their Europe-born children, and the rise of the far right, predicting the riots that we had only a few years ago when he talks about the dangers of a consumer society which encourages people to feel the need to “gratify the needs they are conditioned to feel”. He also speaks eloquently of the role of the government and media in spreading misinformation and dividing communities along racial lines, talking about the British riots of the early 1980s. He’s also scathing about the corralling of educated black people into the race relations industry rather than society working towards true equality – is this not equally true today when we look at those responsible for equalities in government and organisations? It’s not all po-faced, though – far from it – which makes it the persuasive and engaging read that it is. He’s perceptive, self-aware and on occasions, amusing. A good, if uncomfortable, read, and I’m glad I finally got to own and read it. I learned a lot reading this book, and was pleased to note that Sheet 1 of the first map, while nominally being of “Kent”, features the location of my three first homes in London, with their roads clearly visible, even if none of the actual buildings were there yet! Hewitt wears her learning lightly and is able to both give a good idea of people’s personalities and relationships and explain the intricacies of technical detail when explaining the instruments used to do the mapping. Black and white illustrations throughout the text and colour plates, along with extensive notes and a full bibliography, plus the inclusion of a few personal anecdotes about the author’s visits to various locations important to the book (or to her) make this book a joy to read for the expert and the novice alike. A good and detailed history of, indeed, just the Victorian part of Birmingham’s history, although mentioning earlier and later events as it goes. It covers civic leadership, housing, sanitation, education, public buildings, transportation, etc., as you would expect. There is quite a lot of detail, some of which could be considered slightly too exhaustive when we get into civic wrangling, but in the main it’s very good and readable, with excellent overviews of the main characters and their roles. All of the illustrations are black and white, and unfortunately many fall into the central gutter of the book, but there are some good images and maps. Poignantly, as this book was published in 1983, many of the Victorian buildings discussed and pictured, especially factories and other industrial buildings that were already falling into disrepair at the time of writing, have now gone altogether. So the book also serves as a good reminder and archive of those remnants. A good addition to my Birmingham shelves. Oh, and it fills in a year in the Century of Reading! Well, I’m glad that I’ve got through all of the books purchased in January, as I don’t like to be a whole YEAR behind (I seem to recall that I did have a bit of a gap in the book acquisition later in the year, so that shouldn’t be the case soon, I hope). I’ve read a nice book on sewing since finishing these, and will undoubtedly have a few acquisitions and hopefully some more reads to report after Christmas. And, of course, look out for my Books of the Year and reading plans for 2015, to be published on 1 January! For now, though, Merry Christmas, Season’s Greetings, Happy Solstice, or just hello to all of my lovely readers and commenters. Wishing you a great reading year for 2015, although I’ll see you all again (on this screen) before the end of the month! A confession: I received the excellent Victoria Eveleigh books from Orion Children’s Books, then something went awry and I received a parcel of books for younger children. In the excitement of sorting it all out, I failed to notice that I’d been sent “Team Spirit” by Pippa Funnell to review, and have left it rather late to review it. So, sorry, lovely people at Orion, and hope this review makes up for it. This is the first in a standalone series (called Tilly’s Pony Magic) about Tilly and her horse, Magic Spirit, competing in Pony Club Eventing, which is also part of a long series of Pony Tails by popular and successful eventer Pippa Funnell. I think I’ve got that right – the series are intermixed and a bit confusing, but reading the reviews and website, extremely popular with the pony-mad. First of all, I have to say that the author does a good job inserting riding and pony care instruction into the narrative without making it too clunky, which is a difficult thing to do. And while it is something of a celebrity endorsed series, she is following in a tradition which goes back at least as far as Pat Smythe’s 1950s and 60s books about her own stables. While a ghost-writer does apparently help, Pippa has the ideas for the main characters and obviously has input into the educational and informational side of things, and as I said, the story and the instruction are woven well together. The book is aimed at the 9+ age group, although the large print in the book (this was an uncorrected proof so this aspect may have changed in the printed book) and the associated website do suggest a slightly younger audience. Although the characters are teenagers and have some teenage preoccupations, the themes of friendship and rivalry should still work for a younger reader. We meet Tilly and her grey pony, Magic Spirit at a point where they know each other well and have a good relationship, but are still learning. They come across that pony book archetype, the posh girl with the perfect pony, when a team is formed to compete in eventing as part of a Pony Club competition. Things get a bit bitchy, but it’s clear that teamwork is the most important thing, and dissent will threaten the team’s progress. There are no talking horses or fairy dust, with the only Magic being in the pony’s name (there is some horse whispering and Native American stuff, but this is well-known and well-respected in equine circles, so doesn’t come under the pink and sparkly category that many pony books unfortunately fall into these days). While the book might lack the humour of the “Jill” books or the passion of the “Jinny” books, the plot canters along nicely and the values of hard work and team spirit, indeed, are got across without being preachy. I’ve been having some good reading time recently – hooray – so watch out for some more reviews coming up over the next few days … And thank you again, Orion Children’s Books, for sending me this book. What HAVE I been doing? It’s 16 December and this is the first book review I’ve posted this month? I’ve looked around and I really can’t find that I’ve missed out reviewing some huge book that I’ve read. Oh dear! And my TBR has burst (more on that later) so I’ve really got to find the time for MORE READING! I am reading a book on editing to review, so there’ll be a standalone review later on in the week, and I have also been writing up my Iris Murdoch research, which has gone out for comments to my lovely mentors and will be going off to my reading groups once I’ve made a few amendments – that took a couple of evenings. Anyway, here are two book reviews that are both related to booky events. This book was the Books Are My Bag book this month – you can read more about this and this book on Heaven-Ali’s blog and it was she who loaned me this lovely book to read (don’t worry: I’ve got her back with a lend of a little pile myself!). This is a delightful wander though the bookshops of the world, celebrating the shops (whether selling new, second-hand or a mix of books), their owners, customer and pets, with interviews with writers about their favourite bookshops and pages of little snippets and facts. It’s really nicely done by someone who clearly has a huge love for bookshops, and some of the stories about pairing customers and books are very affecting. It was great to see some bookshops that I know in the mix, and good to be reminded of the excellent second-hand bookshop in Reykjavik which I haven’t explored properly (yet). Bookshops do come and go, so it couldn’t be used as an actual guidebook for very long, but it’s a lovely book to dip into, with a gallimauphry of images and impressions of book shops and their owners. We don’t have an independent bookshop in Birmingham, but I would mention the excellent arts bookshop in the Ikon Gallery. Other favourites of mine are Any Amount of Books on the Charing Cross Road, the Penrith Bookshop in the north of the Lake District, Fireside Books in Windermere (which is moving to East Sussex), Halls in Tunbridge Wells (which I think is still there) and the marvellous High Street Books in New Mills. 7-14 December was Willa Cather Reading Week, and again inspired by Ali, I downloaded this book of short stories, reasoning that even if I only read one out of the collection, I’d still be taking part in the Reading Week (and read more about that here and the round-up here). I did actually manage to read the whole collection by the end of Sunday (but didn’t get round to writing this review). I’ve read several of Cather’s novels over the last decade and greatly enjoyed their construction and atmosphere, although these have tended to be her pioneer novels (with the exception of Alexander’s Bridge, which was partly set in London). Here’s a link to all of the reviews I’ve done so far – some early ones laughably wispy! These stories mostly address Cather’s other main strand of interest: the artist and their psychology, with “Coming, Aphrodite!”, the longest and first story, examining both a painter and a singer and their startlingly modern relationship. “The Diamond Mine” goes into the demands placed upon the goose that lays the golden egg, narrated by that marvellous type, the quiet sidekick who’s seemingly there for every event while not taking part in the action themselves. “A Gold Slipper” throws the artist up against the implacable but strangely erodable dislike of Industry. “Paul’s Case” takes a different direction and is a fascinating and hugely atmospheric piece about a boy whose only desire is to grab a bit of sophistication and luxury for himself; I really don’t know how Cather manages to foreshadow the rather grim ending so that it is entirely expected, but a shock all the same, but she does, and she does it well. “A Death in the Desert” is a superb exploration of identity, art, personality and family. These are very good stories, old-fashioned in a good way (I’m one for a short story that tells a proper story) and reminiscent of Edith Wharton’s stories, or even Thomas Hardy’s. I love the way she describes people’s faces and clothes, and the unexpected details of a room in a shabby house or the birds in Washington Square. I have downloaded “The Song of the Lark”, which takes her heroine from the frontier town to a singing career, and will definitely get to that one soon. Christmas started this year with the BookCrossing Christmas party, with its attendant Not So Secret Santa parcels flying around the table. I was thrilled to open the parcels containing these four lovelies, all from my wish list (some wished for aaages ago), as well as a lovely ornament, some chocolate and a Lush Christmas Pud bath bomb. Lucky me! I’m in another two Secret Santas this year – my LibraryThing Virago Group one has arrived and I can tell there are two books in there but I’m not opening it until Christmas Day, and I’m thinking the Project 365 Photo-A-Day one (not yet arrived) might NOT contain books, although you never know (and I will admit to sending my Santee a book …) I also have a little pile of grey-wrapped, grey books which I bought for myself from other people on my trip to the Persephone Bookshop in November – so that’s my own fault, isn’t it. There are two Dorothy Whipples in there, so what’s the betting I promote one up my TBR pile and get into it between Christmas and New Year. 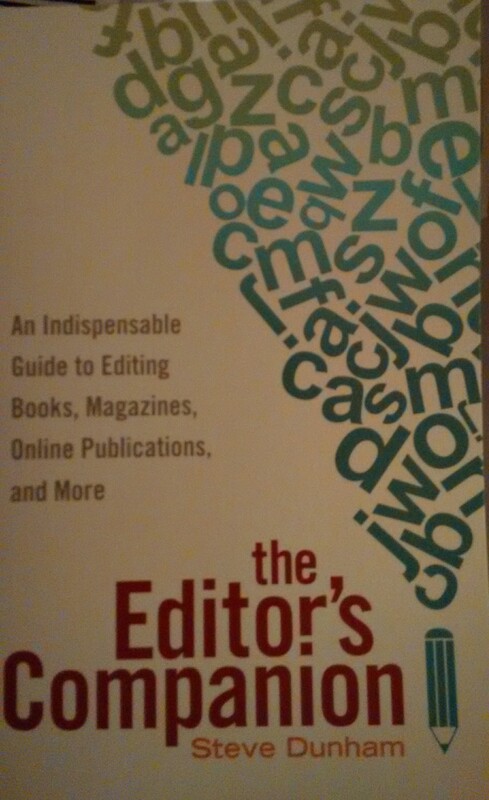 I’m currently reading this book on editing which was kindly sent to me by the publisher. I’m quoted in the book and appear in the index, which is quite exciting (but won’t influence my review, I promise). On reviews, I’ve sent off my piece on James Evans’ “Merchant Adventurers” to the folks at Shiny New Books and will point you to the review when it’s out in January. One more thing – I had a lovely afternoon with Claire from the LibraryThing Virago Group, up in Birmingham for a training day, on Sunday. We had two cuppas, looked round town and peered at the Library of Birmingham, and had a nice meal with Matthew at Woktastic. Here’s a photo for all those LibraryThingers who wanted to see one! Have you received any book-shaped parcels yet? Are you getting any reading in among the tree decorating and card writing (if you celebrate Christmas) or are you planning a reading fest between Christmas and the New Year?